An inspiring biography aimed at middle grade readers! Robert Sengstacke Abbott (1870-1940) was an influential African American who was born in Georgia, eventually migrated north, and settled in Chicago. He studied law and founded the newspaper The Chicago Defender in 1905, one of the first newspapers written for the African American community. Through the newspaper Abbott strongly encouraged African American living in the South to move north, which he saw as a way to escape unjust Jim Crow laws for greater job and educational opportunities in northern states. 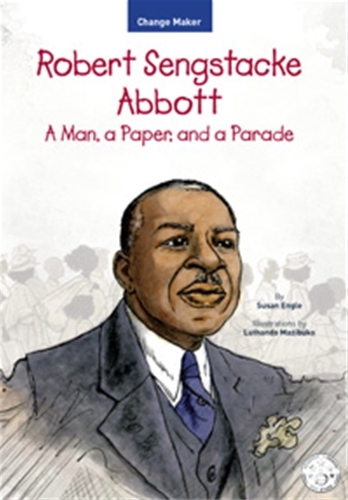 Abbott was also instrumental in organizing the Bud Billiken Parade, a long-standing tradition in Chicago that has been held since 1929, supporting African-American culture, art, and music. Abbott became involved in the Bahá’í community late in his life, attracted to the teachings on religious and racial unity. This is the first book in the newly launched Change Maker Series, highlighting people connected with the Bahá’í Faith who worked to bring about social change.